:The Sticky Faith Guide for Your Family addresses one of the top current concerns about youth and the church: the reality that nearly half of all young people raised in Christian families walk away from their faith when they graduate from high school. That's the bad news. But here's the good news: research also shows that parents are one of the primary influences on their child's faith. This book arises from the innovative, research-based, and extensively field-tested project known as "Sticky Faith," designed to equip parents with insights and ideas for nurturing long-term faith in children and young people. Because of the Fuller Youth Institute's six years of research with more than 500 young people, 100 churches, and 50 families, four of this guidebook's unique qualities make it a "must have" for families eager to point their young people toward long-term faith. First, it's grounded in sophisticated, academically verified data. While Dr. Powell is a parent of three children who authentically weaves her own experiences throughout the book, the chapter topics correlate with parenting principles proven in national research. Second, it is positive. Amid gloomy and theoretical resources, this book leaves parents empowered and hopeful that even little tweaks to their family rhythms can make a big difference. Third, it is practical. Readers get what they want most: more than 100 ideas from other parents they can try today, this week, or this month. Fourth, its "guidebook" format is accessible. For busy parents who don't have time and inclination to read, this format is a welcome resource that they can return to time and time again for fresh ideas and inspiration. 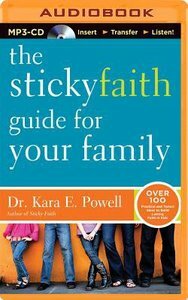 About "The Sticky Faith Guide For Your Family (Unabridged, 8 Cds)"